Listen up, Alabama fans, and listen good. I know you like winning—and I’m about to say something really controversial—but sometimes it’s not the most important thing. I know, I know. But hear me out. Let’s take a step back. Alabama gymnastics is one of the few dynasties in the sport. With six national titles, intense rivalries and a history of excellence, not being at the top of the podium each and every year just doesn’t cut it. For those close to the program at least. It can be hard to take a step back after winning for so many years. And with a football team that doesn’t know how to lose and an expectation of rings, trophies and gold medals, it’s easy to look at one bad year and call for change. But it’s not time to give up on Alabama gymnastics, and in particular, head coach Dana Duckworth, just yet. Alabama’s last title came in 2012 and was the second of two consecutive. That’s six years without a title. Wait. Let me rephrase that sentence. That’s only six years without a title. Duckworth took over the program for the 2015 season after longtime head coach Sarah Patterson stepped down in part due to needing double knee replacement surgery. Duckworth led her team to the SEC championship title that year. Since 2015, the Crimson Tide has remained steady as one of the top teams in the country, making the Super Six every year up until this season and finishing in the top three at the conference championship each of the last four years. So sure this season’s eighth-place finish is disappointing. The team, the fans, the coaches should be disappointed. But it’s also not the end of the world. There are plenty of arguments to be made to defend Alabama’s finish: The season was plagued with injuries, from valuable seniors Mackenzie Brannan tearing her Achilles and Kiana Winston not being at full all around strength to lineup stalwart Wynter Childers dealing with nagging wrist pain and Bailie Key still working her way back from years of elite injuries. You can say there’s more parity in the sport: Kentucky qualified to its first-ever national championships, teams like George Washington, BYU, N.C. State and Boise State made legitimate pushes to qualify. You can even say the other teams were just better. What Duckworth brings to the Alabama program is more than just perfect 10s, championship trophies and big-name recruits. (But she brings those, too. See above.) She brings a culture that has been severely lacking in the sport for many, many years. We all know about the Larry Nassar scandal at this point. But it’s more than that. For years, gymnasts trained in an environment that tore down their defenses, stripped them of their confidence and mentally damaged them so severely many wanted to or did quit the sport for good. Unlike football, basketball or even swimming, nearly all gymnasts use college athletics as a four-year retirement party. Sure there are exceptions, but the majority are there to have fun after a lifetime of hardship and hard work. We like to say, college gymnastics is a place for elites to be happy. But some NCAA programs epitomize that more than others. Alabama is one of them. And it only really started when Duckworth took over. And don’t get me wrong. Gymnasts having fun and being great people is nice and all but WHAT ABOUT THE WINNING??? Because I know that’s what a lot of you care about, let’s go there. UCLA head coach Valorie Kondos-Field is the original inspirational leader. She is well-known for transforming the lives of her gymnasts, making them better people, oh and winning championships. It’s not an either or situation. You don’t have to choose between happiness and titles. UCLA has now won 115 national titles as a school. So it knows all about winning. Arguably even more so than Alabama despite Nick Saban, and previously, Bear Bryant’s football success. And similar to Duckworth, Kondos-Field went eight years between national titles. She even missed the Super Six a few times. But no one called for her resignation or questioned whether it was time for change—at least not publicly or on a fan group on Facebook. With the team’s national title this year, Kondos-Field proved a positive training environment and success can coexist. It just takes time. These gymnasts often come in broken—in more ways than one—and shaping them into champions in the gym and out of it isn’t an immediate process. This is the environment Duckworth is crafting at Alabama. This is the leader you want at the helm of a storied program. So before you call for Duckworth’s head, seek change or take to social media to complain about the state of Alabama gymnastics, consider things more than just collecting championships. Alabama will get there, but the work it’s doing now is more important than any trophy it could ever win. As Duckworth told her team, “You are beautiful. You are lovely. Go out there and enjoy this.” Because in the climate we’re in with the sport now, that’s what matters. I am not going to pretend to be an expert but I see no reason to fire her since I don’t know who out there could do better. Plus, she graduated from Alabama and knows the “Patterson way”. It’s funny you bring Alabama football into the conversation. You should watch Episode 3 of “Bama Cuts” which has four former Tide players discussing having fun. There isn’t any fun in losing. All that said, she needs to have a bounce back year in 2019 to keep the wolves at bay. If you read the article closely, the author is NOT stating that Dana continued the “Patterson Way”. She is asserting that prior to Dana, under Sarah, Bama was part of the bad side of the culture of gymnastics, the win at all costs and don’t care about the person culture. She says that ltBama is now one of the programs that epitomizes the right culture, but “it really only started when Duckworth took over.” As Bama fans, we know this characterization of the program under Sarah is laughably wrong. Wonder why she would publish this misinformation.? With all due dresses, who are you and what direct knowledge do you have of Alabama gymnastics prior to Dana? Dana is carrying on a tradition, started by Sarah and Dave, of love and care for the whole athlete, in and out of the gym and watching Dana put her own spin on this tradition has been a joy – bringing future championships, in and out of the gym! You literally could not publish a more inaccurate assessment of Sarah Patterson and her leadership of the program if you tried. I have had the pleasure and knowing and communicating with many Bama gymnasts and their parents over the years, including a few I know well. Every word any of them has ever spoken about Sarah would outright refute what this article implies. In fact they would go on and on about the love and the family atmosphere and the lifelong friendships and support … all put in place through Sarah’s vision and leadership. Dana has certainly continued that aspect of the program, to her credit. But it did not just start when she took over. Thank you agree! You are spot on! I’m anxiously awaiting Ms Grimsley’s reply. I am not specifically part of the Alabama gymnastics community but wanted to chime in and say that I find Alabama much more engaging to watch with Dana as head coach rather than Sarah. I think it has to do with the way they present the routines. They show more personality/expression when performing and I feel like I’m more connected to the team. I saw that much less with Sarah. However, I agree that seeing a difference doesn’t mean that Sarah treated the gymnasts differently than Dana. She always seemed very caring. Since the author of this opinion piece will not defend her accusations, let me tell you what I know, not what I think or something I heard. Dana is a very dear friend and I will agree that she is perfect for Alabama gymnastics. I was also an Alabama gymnast. I walked into the gym as a wounded, burned out elite gymnast, thinking I could never last another 4 years in the sport. Under David and Sarah tutelage, they turned me into a 4 time national champion. I can absolutely find a ton of alumnus that can, will and do say the same thing! Were they tough? You bet! Were they demanding? No doubt! However, they treated us as young adults and helped us become successful, productive and HAPPY adults. We were never just a routine or a score. Just as in any situation, there may have been some that didn’t have a positive experience but I can bet that those very few, have no one to blame but themselves and their own actions or inactions!! I tend to agree with this article and exhibit A is Peyton Ernst. Here is a near-Olympic elite gymnast who then bc of a series of injuries was never quite at that level again. Florida kept their promise to give her a schollie but they were glad when she got hurt again after one year, bc they could dump the damaged goods on medical redshirt and be done with her. 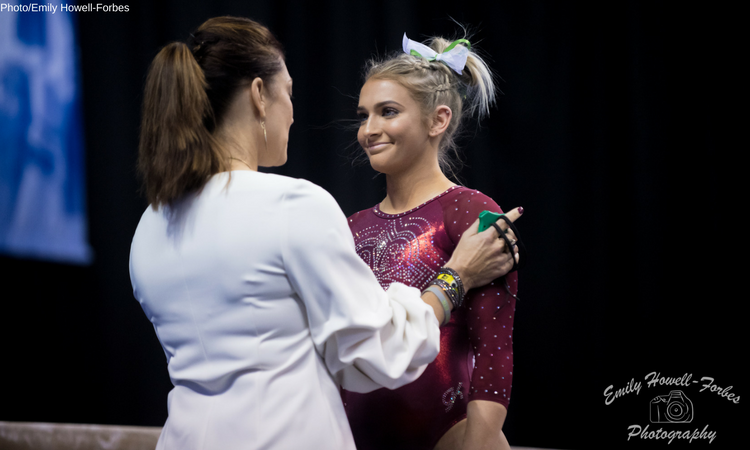 To Florida’s coaching staff, Peyton Ernst was just garbage that they could discard, not a person with feelings, not a girl who’d worked her whole life to be a great gymnast and fought thru multiple injuries that would have made most gymnasts retire. They had no sympathy for her or concern about her emotional well-being. They ended up running her off, bc she still wanted to come back and compete one more time. Dana Duckworth stepped up and took her in and made her part of the Alabama family. Gave her a home as a gymnast. Gave her her chance she wanted to show Florida and to go out on her own terms. To me that example is everything. The way Bama and Florida treated Peyton Ernst is the difference between how NCAA gymnastics should be and how it usually is. I think individual cases can go a long way towards telling us what is what. Take Audrey Tolbert, who was at Ohio State then transferred to WVU for her last couple years. She’s since graduated and become a GA or something at WVU and is clearly part of the family there, after being (or feeling) badly mistreated at OSU. This one case speaks volumes about the cultural environments of two programs and the natures of two coaching staffs (Maddie Herr also transferred out of OSU around the same time while dealing with injury, and had a similarly happy landing at SJSU). OSU bad, WVU good. Sad gymnasts, happy gymnasts. Missouri is another notable case of a miserable environment and culture. Two more happy ones: Michigan and Illinois (under both of the two most recent coaches). And so on. But the key anyway is FAMILY. It has to be a family atmosphere. All the positive places I named have that. All the negative ones don’t. Yes it’s a career for the coaches, it’s cut throat, it’s their livelihoods, but that doesn’t mean your job is to run it like a business. It isn’t football. It has to be a family atmosphere.